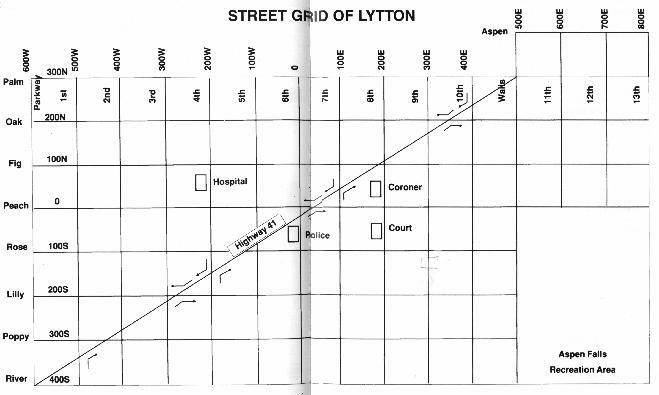 Map - 33 KB - Here is a map of the city of Lytton from Police Quest 3. After the end of Police Quest 2 - and with it, the end of Jessie Bains and Sonny's marriage with "Sweet Cheeks" Marie - Bonds has returned to work as a Sergeant, but has been temporarily transferred from detective work into the traffic department. The game starts out as a prologue to the base plot in the story. As Sonny patrols the streets of Lytton, he receives a call from his dispatcher about an attempted murder sighting at the mall. The victim happens to be none other than Marie. All of a sudden, Sonny is thrusted into his most dangerous case yet. He's back to work in the Homicide Department, with new challenges ahead of him. Police Quest 3 marks a significant milestone in the Police Quest series, although it marks the "conclusion" of Sonny Bonds' career. The game is in full 256 colors, using Sierra's SCI system. The game begins with Jim Walls giving a brief introduction to Bonds and the game. In various points through the game, Walls will also comment on the player's actions (particularly when the player has screwed up somewhere and killed Bonds). The game itself is very challenging, and involves detective work, not to mention lots of discretion, by-the-book routine and note-taking. The beginning of the game is promising. However, as the game progresses, there are certain elements that make it apparent that the game production was rushed to meet a deadline. This includes typos, repetitious puzzles, and puzzles that are trivial to the game's ending and point total. This game is a noteworthy item for any die-hard Police Quest fan. However, compared to many other games of its era, it lacks slightly in variation and uniqueness. Still, there is typical "Sierra Online humor" incorporated in this game. A good way to observe this is to browse the personnel database in the LPD computers.